Sundays and Public/Bank holidays: only afternoons. Free: Monday mornig, 10:00 am to 1:00 pm. Guided tour available by appointment. The meandering woodland gardens, the gorgeous old trees, orchards and of course the most beautiful olive tree avenue I’ve ever seen. It is a magical, most special place. Once the home of the canon of Santiago Cathedral, this charming manor house now boasts one of the region’s best plant collections. In the 19th century, the owner Ivan Armada added many new species to the already established garden, including hundreds of varieties of Camellia, which still bloom today. Unique in the north of Spain, and a truly amazing sight, are the avenues of ancient gnarled olive trees that criss-cross the garden. It is also worth seeking out the delightful stepped cascade, lined with overhanging tree ferns and moss-covered trees. The camellias in the Pazo of Santa Cruz de Ribadulla, gently wrapped in the cellophane-mist, which is so typical of their home, are not merely illustrious, but illustrative. Illustrious for their antiquity, and because of their close links with the household. Illustrative because, even when their bloom begins to fade, their paper-like texture which feels like old silk even after their season is over, must have accompanied the famed writer and politician Jovellanos, as they lay inert on the very same stone table on which the great man drafted some of his most thoughtful essays. 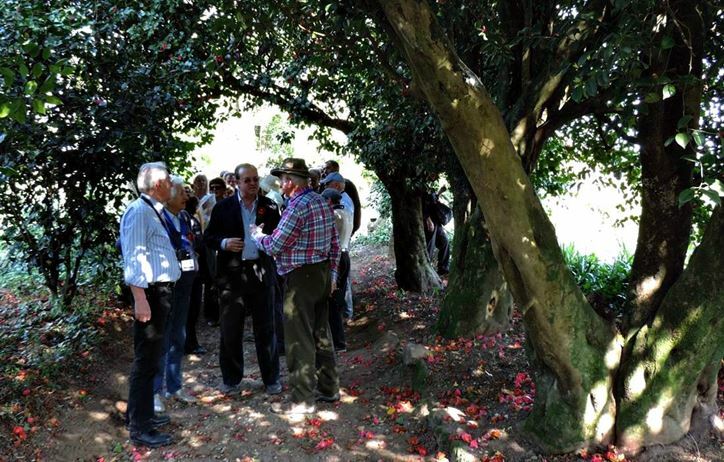 More than 200 varieties of camellias grow here (Vedra, A Coruña) every winter. This special collection dates back to the 19th century and can be considered the best in Galicia. A real forest of flowers (leading to an avenue with hundred-year-old olive trees, a waterfall and a row of box trees) will make you feel as if you were in a fairy tale. You will find it at 19 km., on the N-525 which connects Santiago with Ourense. The main building is not allowed to be visited but the gardens are unforgettable. Huge tree ferns, olive trees 500 years old, magnolias embraced by centenarian creepers, waterfalls, ponds, moss of thousands of different shades. It might seem that it is inhabited by pixies, witches and other creatures of the forest. Its magic is irresistible; we do not know of anyone disappointed with this visit.